Whether you are looking to consolidate debt, cover unexpected expenses, make home improvements, pay for a vacation, or take care of wedding costs, Mariner Finance personal loans are worth checking out. Mariner Finance is a consumer finance company that started in 2002. The company is based in Baltimore, Maryland and has has over 450 branches in 22 states. When you take out a loan, Mariner will report your payments to Equifax and TransUnion credit bureaus, so you can build your credit score over time when you make timely loan repayments. And while the lender provides home loans and auto loans, we’ll focus in this review on personal loans, which feature co-signer support and are approved by loan officers as opposed to computer algorithms. Is A Mariner Finance Personal Loan Right For You? Mariner Finance provides loans for anywhere from 1 to 5 years to borrowers with low credit scores in 22 states. If you have so-so credit, Mariner Finance may be a good match for you. Generally, Mariner likes to see that loan applicants have a decent credit history of at least 5 years but that doesn’t mean you need to have stellar credit. Even if your credit score is around 600, you may be eligible for a loan. You can apply for a loan by filling out a form online, visiting a local branch, or even by phone. Regardless of which method you choose, you can expect the application process to be fast. Loans can be approved and funded in as soon as a single day for loan terms ranging from 1 to 5 years. When you apply, you can expect a soft credit check to be performed, meaning that it won’t affect your credit score to check your loan rate. But rates are steep, ranging anywhere from 24% → 36% APR depending on your creditworthiness. Once approved, you can use the proceeds of your loan for anything from a vacation to a wedding or simply debt consolidation if you wish. Mariner Finance personal loans require collateral as security above $10,000. Co-signers are permitted to join on loan applications and loan officers are responsible for making final approval decisions. The rate you are offered will depend on your creditworthiness, income and debt-to-income ratio. If you have a good history of paying your bills on time and a higher credit score, you may be eligible for the lowest rate of 24%. Even if you are approved for this rate, it is a good idea to shop around and compare interest rates from multiple lenders. Where Mariner Finance shines is that you won’t simply be approved based on the scores you receive from a computer algorithm but instead a loan officer will have the final say. So, if you have good reasons why your credit score may be low, you stand a better chance of being approved versus some other lenders who may rely more heavily on a computer-based approval model. When you compare the rates of a few lenders who cater to borrowers with low credit scores, you might find Mariner comes up trumps because of this personal dimension to the approval process. You can also boost your chances of being approved by adding a co-signer to the approval process. If you choose to go down this path, do your best to verify your co-signer has a solid credit history so adding them to the loan application will increase your odds. Mariner Finance won’t charge you any prepayment penalty fees but origination fees, late fees, insufficient funds fees and personal check processing fees apply and vary by state. Mariner Finance has an A+ rating from the Better Business Bureau, provides co-signer support, and a fast funding timeline in as soon as one day but you pay a price for the convenience because lending rates are high. ✅ A+ Rating: The Better Business Bureau awards Mariner Finance an A+ rating. ❌ Fees: Late fees, origination fees, insufficient funds fees, and personal check-processing fees all apply and vary by state. ✅ Loan Officer Approvals: Loan officers approve applicants, so even if you have poor credit you may be eligible for a loan. ❌ Lending Rates: Lending rates are high, starting at 24% which rivals credit card company rates. ✅ Co-signer Support: To increase your chances of being approved for a loan, you can add a co-signer to your loan application. ❌ Nationwide Coverage: Mariner Finance and its affiliate Pioneer Credit operate in 22 states so nationwide coverage is not available. ✅ Fast Application Process: The timeline to funding can be as soon as 1 day. ✅ Flexible Term Lengths: You can borrow funds for anywhere from 1 → 5 years. ✅ Personal Loan Amount Range: Borrowing amounts range from $1,000 to $25,000. ✅ Wide Variety of Uses: Personal loans can be used for debt consolidation, home improvements, weddings, vacations, and to cover unexpected costs. ✅ Soft Credit Check: Your credit score won’t take a hit when you apply because only a soft credit check is performed. What States Does Mariner Finance Operate In? Is Mariner Finance affiliated with 1st Mariner? No, Mariner Finance and 1st Mariner are not affiliated with each other. Do I need to put up collateral for my personal loan? For loans under $10,000, you won’t need to put up any collateral but above that threshold, you will need to secure your loan with a fixed asset, such as a vehicle you own. Mariner Finance personal loans are designed for borrowers with low credit scores who may struggle to be approved elsewhere. 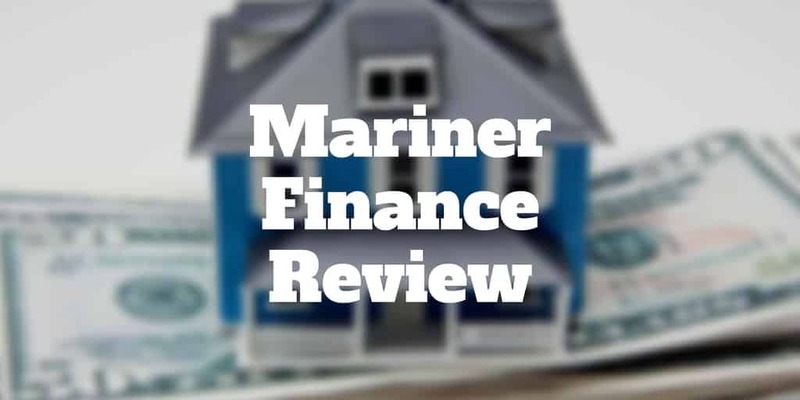 Unlike some other lenders who rely exclusively on computer algorithms to adjudicate whether an applicant should be approved, Mariner Finance relies on the judgment of loan officers who have the final say. So, if you have some extenuating circumstances that caused your creditworthiness to suffer, your loan petition may stand a greater chance of being approved. The rates are high relative to some other lenders so it’s worth comparing interest rates from other lenders, such as OneMain Financial and Peerform, who cater to low credit borrowers too. The good news is when you do submit an application, your credit score won’t be hit because only a soft credit check is performed. Once approved, you can use your loan proceeds for a wide variety of purposes, including debt consolidation, home improvements, covering unexpected costs, or even paying for a wedding or vacation.